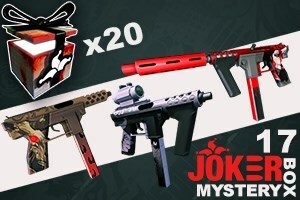 Obeya takes to the streets with Joker Mystery Box 17's exclusive Urban Legends line (UL) of submachine guns. Impressive firepower in a handgun is an understatement with its full auto design and punching power, the UL-3 line will be the sidearm of choice for those aiming to release as much carnage as possible with very little fuss. Configured with the SPEED DEMON SPECIAL which allows you to draw quicker and fire faster, this gun can be called to quickly to rain down hell fire just as fast. The Jersey Devil model is just the curse you need for those wanting speed in every way possible. Named after the female legend of doom, this model comes configured with the DEADLY FEAR SPECIAL. Offering more damage in a silent package this model is for those wanting to dish out damage with a silent touch.